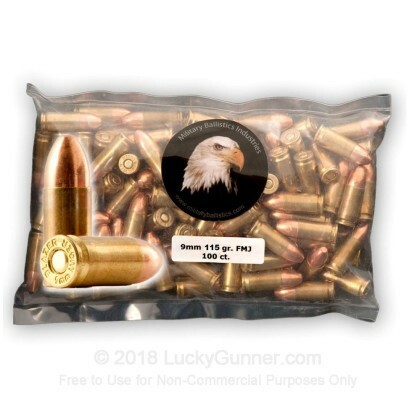 This bulk pack of remanufactured 9mm Luger rounds is one of the best values for shooters who want to build up a personal cache or support their upcoming training schedule. These cartridges are factory reloaded by Military Ballistics Industries (MBI) using once-fired brass which helps keep costs affordable. The brass casings are hand-inspected for dings, splits, and flash-channel dimensions before being cleaned and polished. Each case is then fitted with a non-corrosive Boxer primer from either Winchester or CCI and filled with Hodgdon’s famous powder. The rounds are topped off with copper-plated bullets from Berry’s that weigh in at 115 grains each. That weight is quite common to the 9x19mm caliber and offers light recoil alongside a flat trajectory out to practical distances. Berry’s plating is known for being particularly hard and encapsulates the entire projectile in order to cut down on lead fouling. Each finished round is inspected by MBI before being packaged and shipped out. Military Ballistics Industries makes ammo in the US designed for economical range and training use. Due to a few cost-saving measures, MBI ammo is offered at a competitive price point that can fit almost any budget. All MBI ammo features once-fired brass or nickel-coated brass casings gathered from law-enforcement shooting ranges. This is reloaded ammo, but it's not like what you would make in your basement. It's all done on high-tech, automated machines, and other than the used cases, it's very similar to you would get with factory-new ammo. MBI also uses copper-plated bullets rather than traditional full metal jacket. The copper plating is thinner than a copper jacket, but performance is very similar. I've shot thousands of rounds of plated bullets and not had any problems with reliability or accuracy. However, it's not recommended that plated bullets be used with ported barrels, since the ports can shear off the copper plating. Plated bullets are also less hazardous for use in indoor ranges, since there's no exposed lead anywhere on them. For this test, we shot the 115 grain MBI ammo. We had no problems with function or reliability in any of our seven test guns. Accuracy was pretty good as well, as you can see from this group we shot at 15 yards. Military Ballistics Industries is a company you probably haven't heard a whole lot about yet, so if you've got any questions about its quality or reliability, just check out the reviews on the website. The weekend of 6/21 and 6/22/14 I attended a tactical handgun class. 2 days, 8 hours each 700+ rounds. No problems at all with these 9mm rounds. Cycled in my 92-F with no misfires, no stove pipes, no double feeds. Several hundred rounds gone through in a Springfield XDs and a Glock 19. No hiccups so far. Very satisfied. Not to mention the discount from range prices! Will purchase again soon once I run out! I have shot about 500 rounds of the 1000 purchased. I am well pleased with the performance of the ammunition. The rounds are bright and well finished. The crimp and location is very good. A measured sample for length showed excellent consistency. I am a reloader and I cannot find any faults with this ammo. Cost per round is at a competitive price in today's market. As good as any other brand. This ammo is as good as any other brand of ammo I have ever shot in any caliber. No failures in over 600 rounds through a Bersa BP9cc or the S&W M&P full size. Very clean burning and no noticeable variations from round to round in recoil. I will buy this again. So far, put 300 rounds through a glock 19 gen 4. Had 6 cartridges fail to eject. You could feel the recoil was less than normal, and they had to be ejected by hand. No misfires. Not ammo I would use for carry, but for the range, you can't beat the price. Pulling the slide back a few extra times is a small price to pay for this price. Good buy overall; I'll be back for more. Ordered 1000 rds. Great ammo for the range. Not a single misfire or failed to feed properly and didn't make my gun dirty. I was really hoping that all the reviews I read here were true and I can tell you they are true. These rounds are wroth every penny. Shout–out to Lucky Gunner for the fast shipping. Just ran about 200 rounds of this ammo through my Glock 19. I experienced about 7 malfunctions, all failure to eject after what was audibly a "light" round, i.e., not enough propellant to properly cycle the pistol. The malfunction was easily cleared, but this ammo is strictly for practice use. I would not use it for defense or competition. Considering what it is, I feel it still represents an OK value. In the future, though, I will probably not be purchasing this ammo. I've shot probably 800/1000 rounds of this ammo without a single misfire. I would buy this stuff over any of the big names (federal, winchester, cci, etc) any day. Great stuff. this is my first handgun, first purchase from luckygunner. i'm using these in my beretta px4, 200 rounds in and no problems to report. will be buying again. Extremely nice reloads. Feed was problem free. fired all 1000 rounds no probs. Went to the range with my son and went through 250 rounds in less then 30 mins. Not a single missfire !! Both my son and I just bought Glock 34's and at 25 yds they were right on point !! Great value !! To be honest I am keeping this site all to myself.. GREAT VALUE AND SHIPPED QUICKLY ! Shot several hundred rounds through both my High point carbine and my beretta 92a1.Ammo cycled without a hitch.Very happy with purchase. I haven't had a single problem with this ammo. Have shot 4,000 + rounds with 3 different guns. There is no discernable performance up to 25 yds. You would need to pay much more for dead-on accurate ammo. I recommend it to all other shooters I meet. I have gone through about 2500 rounds and had no misfires or failures to feed. The accuracy is good and the price is great. My CZ SP-01 loves this ammo. Good for the range.....good for the price...can't go wrong! Good for the range...was pretty clean..good value..shipped quickly...great service...thank you!! This is the second order from Lucky Gunner. Great service and a great value for this product. Not too dirty and pretty accurate. Put 100 rds. through a brand new XDM 9- No FTF or FTEs whatsover. Seems pretty clean, and at approx. 21 cents a round, how can you go wrong? Will buy more to stock up for target shooting. Geart prices on Geart products ! My Ruger SR9 just loved FMJ Military Ballistics Ind. and geart value pre-round. Working like a charm, I am very happy. Have fired over 2,500 rounds through my Sig Sauer 226 with no problems. Great Value, good product & great service. Thanks Lucky gunner!! easy to navigate web site, easy to order. For the price, you can't beat it. Good ammo for the range. No problems yet. Arrived at my front door in just a few days. I recommend this ammo to everybody. My Glock loves it. Excellent deal for 1000 rds of 9mm. Fired 50 rds through my PX4 and 150 rds through my CX4 without any jams or misfires. Lucky Gunner you ROCK! Excellent! Have had no issues with this 9mm ammo. I use it in my Beretta 96A1 without any problems. Very good ammo, and a very good deal. Also, the service has been top-shelf. Thanks Luckly gunner. After firing over 500 rounds, not one problem. I will be repeating my order for more of this ammo for the range. Fires just fine in both my 9's. now, to the range ! Just put 300 rounds thru my XDM without a single problem. Very fast delivery and great price. Just finished 2 thousand rounds. Almost all good. Shot well in all of my weapons. Only problem was that 5 of 2000 had the primers in backwards. Ordered the ammo and 3 days later they were on the front porch. Great service, will order from again.Haven't had time to make it to the range yet but looking forward to burning a few rounds and not worrying about the cost of bullets. Ordered 1000, have ran about 500 rounds through my Springfield XD 9mm and not one dead round yet. High quality re-loads, that honestly have been more dependable thus far than some top-shelf rounds. Would totally buy again...Lucky Gunner is AWESOME! Have not had one miss-fire yet out of these rounds. Very dependable, great value for range training! Fast shipping and great product. Brass worked great, no duds. I will be back. Fired 300 rounds through my Gen4 Glock 17 with no problems. I have not found any dented or damaged rounds so far. Highly recomend this ammo. 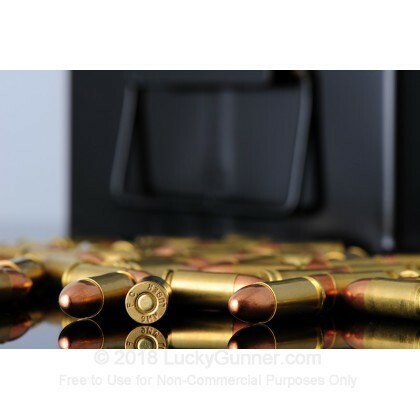 This is a great deal on 9 mm ammo, runs great in all my 9mm guns with no jams or misfires. These rounds not only shoot clean, but are clean themselves. My thumb and index finger usually get very dirty after a day at the range with brand-named, boxed ammo, but with these I walk out with very little "stains" on my fingers. I like the thick plastic bag packaging. I'm able to carry more in my range bag because it saves LOTS of space. This ammo shoots well. No problems. They're as good as any familiar brands of ammo. And without a shred of doubt, they are significantly better than particular brands of factory ammo from Russia or Hungary. Purchased 1000 rounds and shot it all over 2 days. No jams, misfeeds or any other issues. The cases looked good enough to be reloaded. The ammo is worth the price. So after I shoot the reloads I will be ordering more. I just shot three hundred rounds and had no issues. 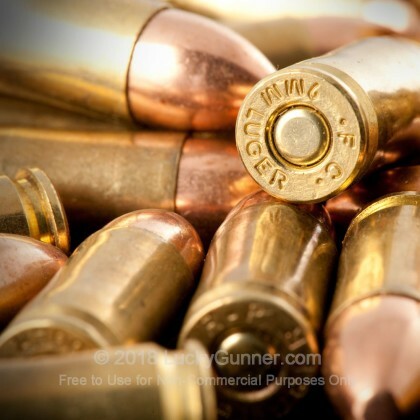 The whole purchase process was flawless and the ammo functioned true to other reviews. Excellent reliability. No miss fires. Best deal I've seen on practice ammo. Fast Shipping and a great product for the price. I ordered 1000rds of this stuff and it only took a few days to show up in Florida. I have ran about 300-350rds thru my Glock 19c and had no issues at all. I put all 1000rds into keeper boxes and found only TWO imperfects when I was putting it away. It shoots just as straight and clean as some of the factory new fmj I was shooting and that stuff was $20+ per 50. I am very pleased with this product and even happier I found out about LuckyGunner.com. To borrow a line from the Governator... I'll be back! Fast shipping and everything was as advertised. Will be buying from this site again soon! with the exception of one malformed round so far, i have had no issues with this bulk ammo. and the price is hard to beat. Recieived quickly. No failures of any kind. Would like to see prices remain constant. Bought for $195.00/1000, now it's $200.00/1000. Still looking for more economical means of having fun at the range with 9mm. No misfires , no problems whatsoever . Shot all 1000 rds thru my SIG 226 during an NRA Instructor Recert course . Excellent reliability and accuracy. Fantastic! Great value for the ammo. I don't make my own, so this is the perfect range ammo. Worked flawless in my Springfield XD. I will buy this again! Fast delivery and great product!! Good price for a quality product. The product was delivered in on time and as advertised. Used 100 rounds today in my Sub 2000 and Handgun (XDM). 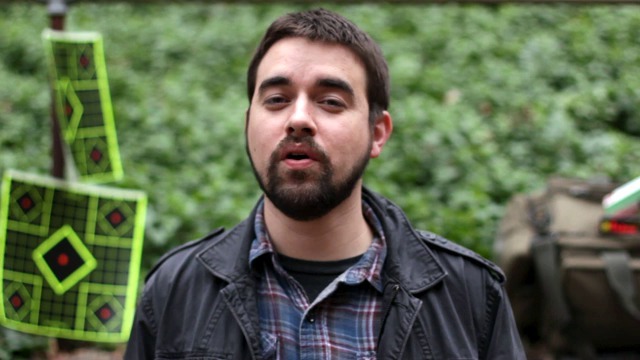 Performance excellent with no FTF, FTE or other problems. Great for practice and range work. Buying another 1000. I purchased 1000 rounds of this Ammo last week. I received it in like 3 days. I shoot 100 rounds of it today at the range. Excellent Ammo. A great valve. Will buy more. Had my new XDm for 3 weeks... and 2000 rounds of MBI 9mm later,many holes in the 8,9,10 rings and no miss fires no hung shells. Also only two gun cleanings. Buy It-Shoot It! Hits where I aim! No jams in my carbine or either of my handguns. Hope for more at this price! Hint hint! This ammo fills-the-bill. I have not had any miss fires or bad loads. I will continue to get my supplies from Lucky Gunner. 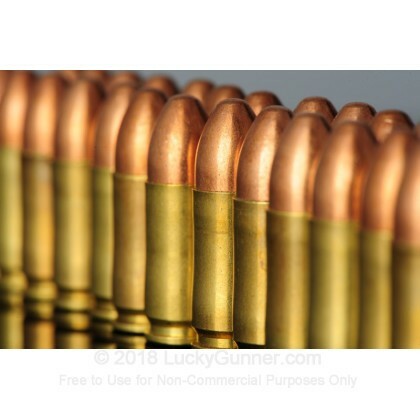 In shopping around for 9 mm ammo, it is great to find a web-site that tells you how much is in stock and has good prices. My wife just got a new 9 mm and likes this product. I like it because it is made in the USA and recycles used brass.